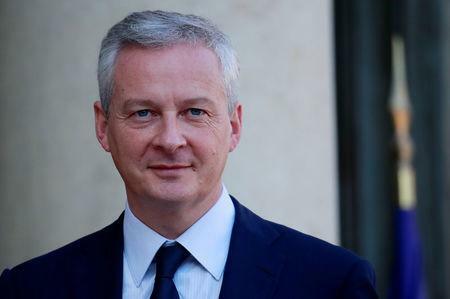 PARIS (Reuters) - Europe has talked long enough about whether to make internet giants like Google , Apple and Facebook pay more taxes and it is time for a decision, French Finance Minister Bruno Le Maire said on Thursday. President Emmanuel Macron's government has led a push for firms with significant digital revenues in the European Union to pay more tax at source. Germany has long been cool to the idea, while smaller member-states with low corporate tax rates such as Luxembourg and Ireland firmly oppose the proposal. "Enough of talking. Enough words. Enough excuses!" Le Maire said in an interview with Public Senat TV. "What's getting in the way, as always in Europe, is a lack of political will. All the technical issues have been resolved." Voters would punish mainstream parties in next year's European elections if the bloc appeared incapable of standing up to corporate giants and protecting citizens, the finance minister said. "It is time for Europe to decide whether it wants to become a submissive continent...or a sovereign continent," he said.